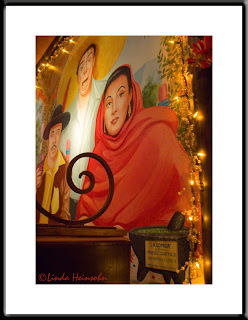 The decor at Sol Y Luna is so well thought out and executed! http://www.solylunarestaurant.com/ I recommend all Angelenos rush there to enjoy the food and ambience! Did I mention they have a strolling guitarist who plays for you while you eat? The main dining room includes a full wall mural of which I've made art of one end. The painter is Miguel Castillo. (I looked for his website or other credits but couldn't find any.) From the restaurant website: A colorful wall-length mural by artist Miguel Castillo depicts famous Mexicans Emiliano Zapata, Pancho Villa, Frida Kahlo, Pedro Infante, Luis "El Gallo Giro" Aguilar, Maria Felix, Mario Moreno "Cantinflas," Agustin Lara, German Valdez, Adalberto Martinez and Dolores del Rio. They appear to be looking at the dining room patrons with approving eyes.